People who are thinking to travel and want to do advanced booking, then here is the place they can do that. The 60 days advanced booking services are available. Travelers will get trip sheets right before 30 minutes of their departure. That is why, people can even book tickets when trip sheets are preparing. 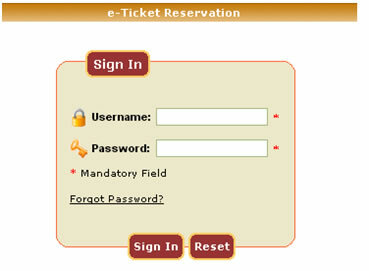 If the passenger has paid the amount of ticket but did not receive his E-ticket, then it is necessary to go to his account and check the page E-Ticket Booking History in order to confirm if he has got the ticket or not. If the page does not show any receipt of Ticket, then it is advisable to make a application at E Ticket E-Mail ID and Contact Address page to refund the E-Ticket. 1. Date of Booking, Journey Date, From Place, To Place, OB-Id No., Amount, Copy of users Bank Account Statement. Back or forward buttons should not be pressed while making transactions. Page should not be refreshed while making transactions. Reliable connectivity is important during the transactions. Every transaction should take around fifteen minutes or else seat might be allotted to someone else as the applicant has taken much time to make a transaction.